A protest banner reads “Build bridges not walls” has been draped across London’s Tower Bridge people all over Britain prepare to protest against Donald Trump’s inauguration as US President. Met Police have Conditions imposed on protest processions set to take place on Saturday, 14 July. 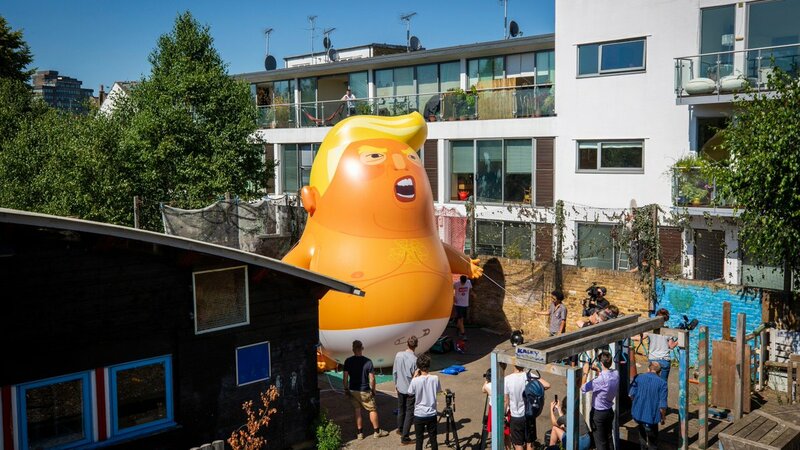 London Mayor Sadiq Khan has granted permission for a giant inflatable figure depicting Mr Trump as a baby to fly over Westminster for two hours on the second day of the president’s visit. 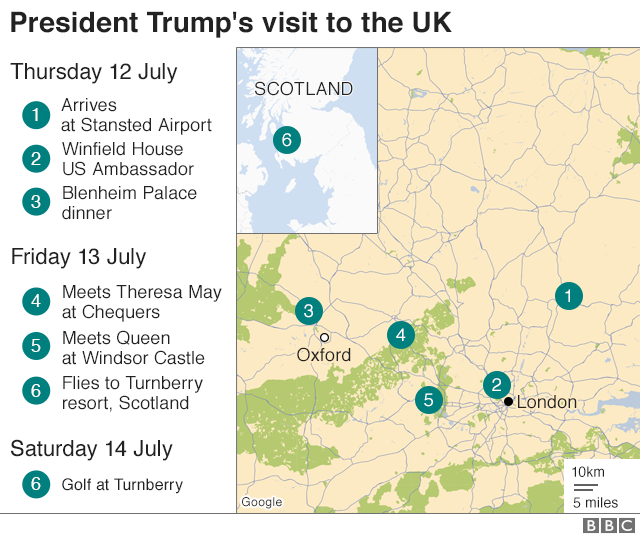 US President Donald Trump has said he is “fine” about the protests expected to be held during his UK visit, saying Britons “like me a lot”. 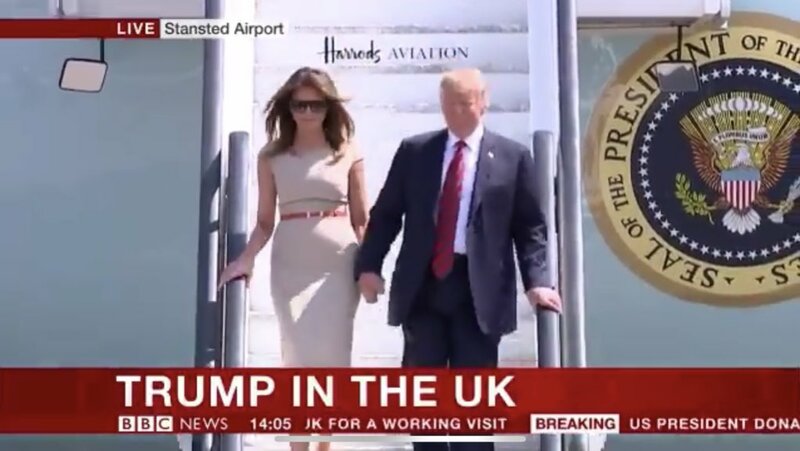 Speaking earlier at the Nato summit, Mr Trump – who arrived in the UK shortly before 14:00 BST – referred to Britain as a “pretty hot spot right now”. He will meet Theresa May later, who wants a post-Brexit trade deal – days after he said the UK was in “turmoil”. He is also to meet the Queen. Ahead of Mr Trump’s visit, Mrs May said that when the UK leaves the European Union “there will be no alliance more important in the years ahead”. On Friday, Mrs May and Mr Trump will go to watch a joint counter-terrorism exercise by British and US special forces at a military base. A significant policing operation will be in place for the duration of both events on 14 July, which is designed to prevent trouble from flaring up and facilitate peaceful protest, whilst ensuring Londoners are not unduly impacted. Dedicated teams of highly flexible officers will be on standby at key locations in the Capital. Police Liaison Officers will be present to assist with engagement for peaceful protest. Chief Superintendent Elaine Van-Orden said: “We police hundreds of public events and demonstrations in Central London every year and we always facilitate peaceful protest. We have such serious concerns about this event on Saturday 14 July, that we have made the decision to impose conditions under the Public Order Act. We have a duty to ensure that the community can go about their daily business not unduly impacted by demonstrations taking place. The form up must not commence before 1300Hrs; Any procession must commence between 1300hrs and 1400hrs.The route of the procession must follow the following route: Temple Place, Embankment, Northumberland Avenue, Whitehall Place and Whitehall. • Any other march that is associated with Welcome Trump and free Tommy Robinson cause will contravene the section 12 public order act conditions.